Diwali, also known as The Festival of Lights, is a festival which originated in India, and is now celebrated all over the world. This special occasion, which celebrates good defeating evil, is marked by lighting of thousands of clay lamps, fireworks, sweets and communal prayers. It’s a festival limited not only to Hindus, but also to people of other religions, as it is a time of spreading happiness, and getting together with family and friends. With festivities comes a period of preparation, and with that comes a lot of work. Apart from prepping and setting up decoration, letting others know about the Diwali event is equally important, Luckily, PosterMyWall offers you the tools to create great looking visual content for your event, though you’re not limited to just posters or flyers. If you’ve created an event through social media (such as Facebook), we offer templates of all sizes, optimized for social media. Check out our gallery of templates dedicated to Diwali. Below are some templates that you may find useful or inspiring, which you can customize and use for your event. Created by Ana Silva de Ortiz, she decided to keep her design simple, giving more room for important details. It’s an excellent approach if it guarantees success while saving effort. The use of earthen colors brings with it a calm to the posters. It also resembles the color of Henna and clay lamps, both prevalent in Indian culture. We love this poster because of the great choices in fonts. One glance and you can tell it’s a Diwali poster because the english font looks similar to a Sanskrit style. This template was created by Arielle Danos. A poster that promises serene festivity, as depicted in it’s lovely background. The orange and white font contrast nicely with the black color, and the intricate filigree work matches with it. Design by Created by Me. Created by Arielle Danos, this beautiful design is a common design used when making temporary henna tattoos on the hands of Indian women. The earth tones also bring out the design. Earth tones are great and all, but bright colors have a world of its own. As earth tones present calm, meditation and serenity, bright colors present action, decisiveness, and in the case of this poster, fireworks! Designed by Li’l Ratskull Designs. This Diwali poster really stands out from the rest, thanks to its bright red color. The color red represents action and passion, so the biggest call to action here is it’s vibrance. Designed by Cantabile. A good photograph can work as a great layout for your poster as seen here. Just take a good photo from one of your past Diwali events and edit it on the Poster Maker. It will get resized easily to poster size. You can also use stock photos if a photograph isn’t available. You can upload your photo as either the background of the poster or as an individual image. Note that your photo should be high resolution to look good on your poster. A modern approach to your poster looks great especially if your goal is to advertise a discount for Diwali. The bold font demands your attention, and the bright contrast helps with that. Created by Renee Nicole. 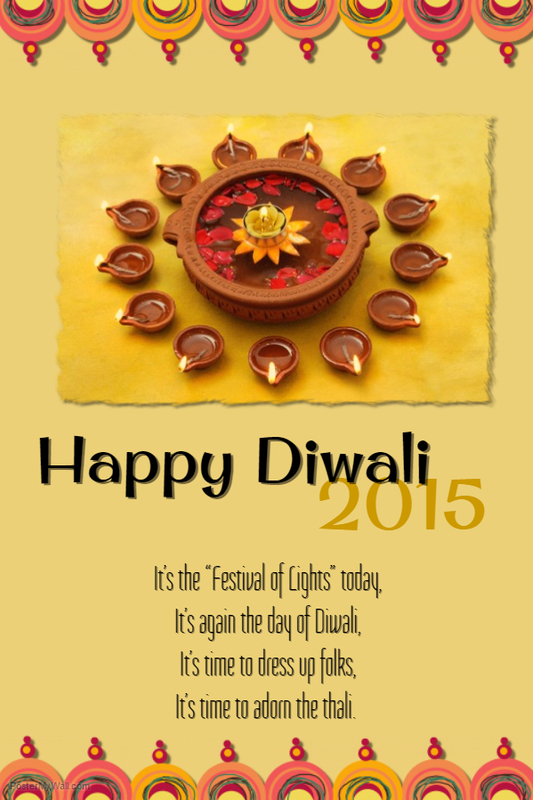 You will find more templates in our Diwali gallery at PosterMywall. You can also check out our Pinterest to get more ideas for designing a poster for Diwali or any other event. We’re also on Facebook, Twitter and Instagram.